So, i've been thinking for a while about what I want, and when I say a while, I mean a long, overdue and drawn-out time period where I was incapacitated in my load of work and me being undecisive in my thoughts. But luckily after a while, I've sorted it out... mostly and I have only 3 (maybe 4, I'll discuss that later) routes I am interested in going down - it's futile trying to suggest new things because I've been in a confused state for far too long. Yes I still have this dismantled piece of shyte lying about. If I were to continue this path, the essential parts I still need are the Noveske Gen 3 body, stock and buffer tube, battery and mosfet, and mags. Other important but not necessarily needed part yet, are a micro H1, Mbus sights and a KX3. The essential parts alone will set me back around £250 to complete, the other parts I can resume building later. As far as my interests go, I'm not inquisitive about M4s - the reason why I chose this in the first place is because it's compact, somewhat lightweight and an abundance of aftermarket pieces available so if sh*t breaks, it's easy replaceable. I'm not a fan of the looks at all and I only chose the Noveske because it's one of the better looking variants - yes i'm finicky about aesthetics, call me pedantic. So if I complete this build, I know it is going to work. Yes I like M14s... a lot. 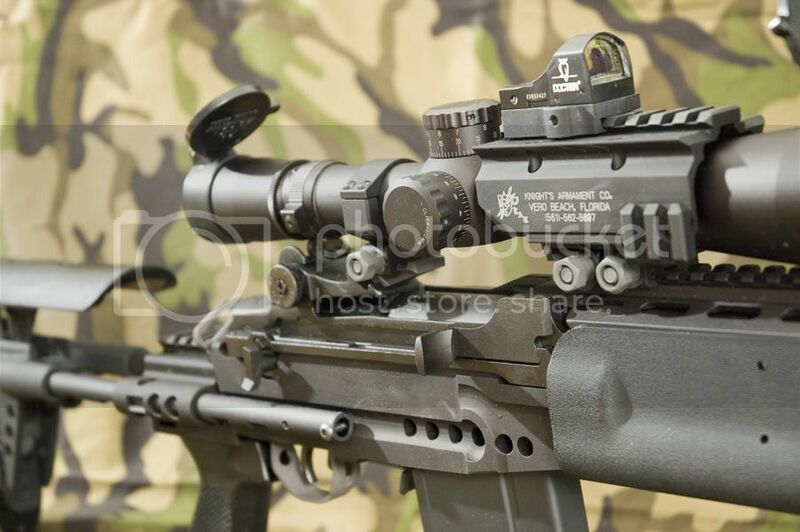 Especially the EBR varaint with it's voluptuous rail space eargasmic charging handle. The particular model I'm looking is the CYMA M14 EBR and i've heard a lot of mixed reviews about it. I couldn't care less about the reviews about the interals because i'm going to tear all that out and upgrade the sh*t out of it anyway. What matters is the externals and with me going to the gym and lifting weights, I'd wouldn't mind a bit heft in my guns, infact, I'd like some (although i'll probably regret it later on when i'm tired on the field). From what i've heard, the body is made from pot metal and the grip and stock are held together by a single screw... or maybe 2 I dunno. But the point is that it's not as robust as it should be however I've also heard that one guy welded the grip and stock back together with the body when it broke and has been a joy ever since, and since i'm going on to do mechanical engineering at uni, I don't think they'll mind me zipping in and out doing a bit of cheeky welding? Well I think they will however the point is that it is possible for me to fix the externals if they break. Also why CYMA and not G&G? Because it's too damn expensive. 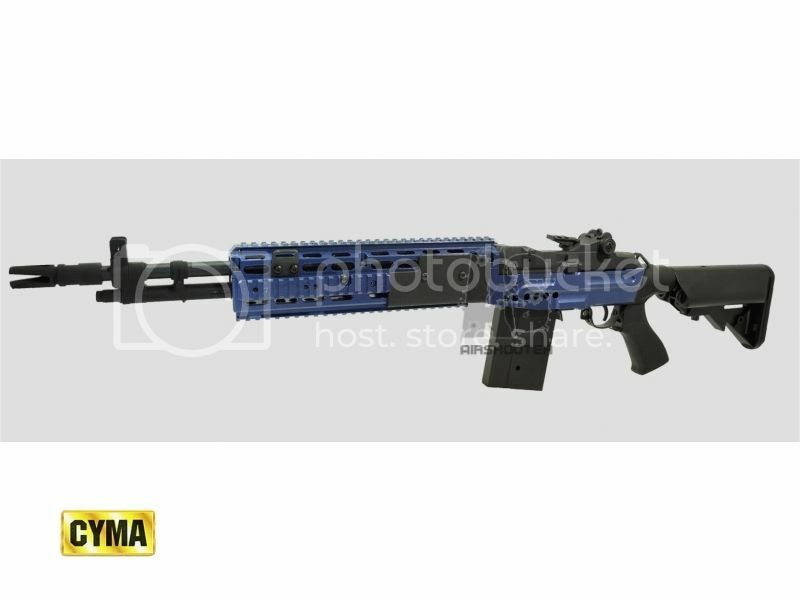 So if I were to get an EBR, I would have to sell all my M4 parts to fund it and after some meticulous calculations, I've come to a decision that on a worst case snecario, i'd get around £250 for all my parts (all bought new was about £400+, so less than 2/3 of retail value). This would cover the cost of the rifle itself, and the cost of upgrades would total around the same amount, which is also the value of the M4 essential parts. It's darker in real life than it looks in the photo and honestly adds a nice contrast to the aesthetics. The last gun I opted for is the ASG Scorpion EVO. I know I am contradicting all of what I said about wanting a bit of heft however, I also don't mind a lightweight gun so that I can be a bit more fast paced. Out of the box all I would need is an m100 spring, micro H1 and a 11.1v lipo and i'm ready. However later I would add a menacing looking muzzle break and probably some 16:1 gears. Practically wise, I know the EVO would be superior due to it's lightweight and maneuverability followed the Noveske, probably out performing the EVO range wise, and with the EBR trailing behind... however probably with the greatest range. Aesthetics wise, the EBR would be my prized possession without a shred of doubt, but is it worth it which is my question. The Noveske would just be a slab of metal lying about and I probably wouldn't care for it - the EVO I would service once in a while. Now I mentioned this at the start that there might be a forth option and that would be an AK platform of any kind that had some decent aesthetics because i'm not AK47frizzle for nothing eh? eh?......... ok den. Currently my eyes are kind of set on the EBR for now however I am second guessing on it's practicality and if I would eventually succumb to hating it. M4 would work well but not exactly my cup of tea, EVO would be most practical however I only just favour it over the M4, and the other AK products have dimishing qualities... I've also used the rental G36c's at my skirmish site a few times now however i'm really not on tenterhooks about using them again. I've got experience with two of these (sort of), so thought I'd weigh in my opinion. I've got a G&G M14, which I know you said was too pricey for what you're doing, but to be honest, unlike the CYMA, the internals don't need replacing. I've been using mine stock for about 6 months now, and it never lets me down. It might be cheaper to just by a better platform than spend a load on upgrades. Can't comment on the EBR externals though, mine's a classic wooden stock version. But the internals are top notch right out of the box. As for the LCT products, I've got a SR-3M. Honestly, it's the best gun I've ever bought. It's got some crazy range and accuracy on it, and being full steel, it feels great to handle. You can get 250rnd hi-caps for the LCT Vintorez/AS VAL/ SR-3M range, not sure if that helps the magazine situation for you. Battery space is indeed limited though; the AS VAL takes li-pos in the silencer, but the SR-3M is a little more tricky. They sell a tiny li-po that fits in the handguard, but personally, I just cable-tied a standard NiHM underneath where the fore-grip normally folds up. I always play with the fore-grip down, so I've never had an issue. It's a matter of preference though. Personally I run the M14 and SR-3M at the same time, as the SR-3M is small enough to fold up and wear on your back for when you just want to rush a position or something. They're both great guns, but if I had to pick only one, I'd go with the SR-3M. Excellent performance, very compact package. Hope that's of a little bit of use. Either the TM AK102 or Skorpion Evo. I have the cyma ebr and the stock wobble is an easy fix, just one screw holds the back end onto the receiver - tighten it up and threadlock it. Job done. Also, the internals don't NEED to be replaced straight away. So i've come to the conclusion to go for practicality over aesthetics, therefore, i'm going to continue with the Noveske. I just know it will work for years to come. Maybe i'll go for the EBR next time.